Count Alfred d’Orsay (1801-1852) was a French-born dandy, said to be the "most fashionable man in the most fashionable circles in the most fashionable town in the world: London" (Last of the Dandies: The Scandalous Life and Escapades of Count d'Orsay, by Nick Foulkes). He dabbled in perfumery; the Parfums d’Orsay line was launched after his death, reportedly using an original Count D’Orsay formula for a fragrance called "Eau de Bouquet", now renamed Etiquette Bleue. I do not know the detailed history of the line, but they were issuing new fragrances into the the 20th century, and the line was "revived" in 1995. Earlier versions of Tilleul were released in 1927 and 1955. The current reformulated version was created by Olivia Giacobetti. It features notes of lemon tree leaf, angelica, watermelon, lime blossom (aka linden or tilleul), cyclamen, cut hay, acacia wood and beeswax. Joining me once again for an opposing viewpoint is Marlen, one of the moderators on the basenotes forum. He says: My friend Karen and I had 90 minutes to kill before a matinee of Amadeus some years ago and so we decided a quick stroll down 5th would be a great way to pass the time. She wanted a fragrance that would be hers — unique, soft, personal, and feminine. I wanted to buy the entire first floor of Takashimaya (this was before the renovations)...our last stop was Bergdorf, where we discovered a line by the name of D'Orsay. D'Orsay has proven to be a house with clever scents and years of history behind it. I fell in love with Le Dandy, Karen with Tilleul. Sadly, I couldn't share her enthusiasm with the "scent of summer lime blossoms". The scent reminded me of the short-lived "scented Kleenex" line from the 80's, a comparison that can't be shaken. The scent was lovely, yes, but insipidly so. With a slightly fruity edge, the powdery lime blossom smelled almost musty to me, perhaps from the beeswax and hay notes. On my skin it started and ended with linden, and I don't like linden. Karen loved it, however, and I have to ask her if she still wears it or bought a second bottle. For me, I would neither want to wear it myself nor smell another wearing it. This would be a good scent for the powder room. 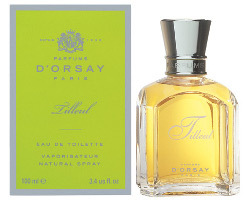 She says: D'Orsay Tilleul is one of my favorite summer fragrances. It starts off crisp, with linden and citrus, and settles into an airy, delicate blend of linden and hay. The beeswax is quite pronounced — if you have ever smelled a real beeswax candle, you will recognize that honeyed aroma here. I have seen complaints that the watermelon note is overwhelming, but I don't notice it. It is a calm, placid scent, something to wear while napping in a hammock on a hot summer day. It does smell clean, and maybe even a little soapy, so as much as it hurts, I have to concede that I understand the references to powder rooms and kleenex. To my nose it is the nicest linden around, but as Marlen suggests, if you don't like linden, it is probably not going to end up gracing your dresser. Tilleul is an Eau de Toilette, and the lasting power is so-so. For buying information, see the listing for Parfums d'Orsay under Perfume Houses. Excellent review duo, as always! I love the scent of linden trees in bloom, and searching for a perfect one was a mission of sorts for me. My favourites are Demeter Linden and L'Artisan Parfumeur Tilleuls au Vent, which is actually a roomspray but works well as a fragrance. I love linden note in La Chasse Aux Papillons. D'Orsay dries down to be too soapy on my skin. I have little tolerance for soapy notes, and it delivers plenty of them. Beeswax ends up jarring, and it is just about all I smell. However, if one does not mind soapy, this is a great summer scent. I have recommended it more than once whenever the topic of summer scents comes up. Wonderful review as always! I wore this years ago and it is perfect for hot summer days. Like V – it turns soapy on my skin and now reach more for La Chasse! Lovely review-this is one of my favorite formats. The Tilleul also turns soapy on my skin which is why my hunt continues. Perhaps I prefer to 'smell' Linden than to smell 'like' Linden. Of course that won't stop me from trying. V, I love Tilleuls au Vent & perhaps will do that one tomorrow. I don't ususally like soapy fragrances either. In this case, it is so soft that I don't mind. Thank you N. Love La Chasse too. I wore Tilleul d'Orsay in the early '70s. It was supposed to be for men and I was being a little “adventurous” by wearing it. LOL! It's very nice but it has no lasting power on me. J, Not sure, but I think it is still marketed as a men's. Maybe it is because of my own linden associations, but it smells closer to feminine than masculine to me. Thank you for this! And do you remember one of the characters in Perfume as a nobleman-perfumer? I think I remember this … and wonder if he was patterned after d'Orsay!? Hey, good memory M! Will have to go & see if I can find that section; looks like we're still going to have a long wait for the movie version. p.s. – How lucky am I to be given the privelege to collaborate with Robin on these reviews? I'm having a great time and can't wait to write the next one! LOL — Where are all the linden fans today?? I have been deserted. Yay Karen! I am just about completely without support here. And it is a privilege to argue with YOU, Marls. I love linden myself, but have not come across too many fragrances that contain this note. I adore La Chase Aux Papillons and hope to add this to my collection someday. I recently tried Jo Malone's French Lime Blossom, but found that it became much too sweet with my body chemistry. There is a little French perfume/soap store where I live called Lolanthique. They carry many brands of soaps & frangrances from the south of France, but have their own version of Tilleul. It's lovely! so soft and fresh smelling! Any other Lime blossom recommendations? bravo both of you for another enchanting duet! i haven’t tried d’orsay. from reading the description, i’m thinking maybe the watermelon note in this would bug me. i adore linden blossom (in anything, tea, lime blossom honey, mmm). so far, the only commercial preparation i like is aftelier’s linden blossom. also, there is a dark lindeny creature lurking in bond no.9’s noho, but it’s not my old familiar linden. nothing that would send me into a proustian scramble for madeleines and my cuddly torn tina turner private dancer tour t-shirt (and how embarrassing is that?). i wish someone would make a purer linden scent. you can get the absolute from liberty natural ($24.02 for half an ounce). i mix it with unscented lotion or dilute with a carrier. or if you wanted to you could layer it (but i don’t know what with). anyway it’s nice! I haven't tried the Lothantique. My 2nd favorite is L'Artisan Tilleuls au Vent, which is a room spray. I think it is supposed to be the “sister” scent to La Chasse, but it is more focussed on linden. I may try to review that later in the week. Provence Sante makes a linden, but it is very strong and I don't care for it. Some people like L'Occitane's, but I find it too sweet-pretty. There are some fragrances I wish I could like. This is one. Alas, no. I look forward to reading about the second linden fragrance, however. I have heard good things about the linden EO from Body Time in California as well. Will try to do the L'Artisan later this week L.
I just sampled this fragrance last week and found it overwhelmingly reminiscent of just those little pollen/hay particles which set off my allergies so well in spring. I could not wear this for fear of an anaphalactic attack For my dose of hay I have been enjoying Extrait de Songes. I can see that completely…it smells like a hayfield surrounded by linden trees. Hope you have seen the rumors that Extrait de Songes may be pulled from the market soon; you might want to stock up now. Dandyish, though I have no idea what these guys wanted to smell like, I must read the book! Incidentally I'd like to point out, because it is confusing, that Tilleul translates into Linden and it is also called Lime Blossom, which confused me for quite a while! I adore Linden, and Tilleul au Vents seems to be the truest to my nose. I don't remember the “real” smell of Linden trees well enough to know which is the “truest”, but I love Tilleuls au Vent too. Welcome Sisonne! I have not tired the Fresh Linden but will have to look for it. Can you get some loose lime blossom from a health food store? Tilleul is my favourite infusion. It's so soothing. J, the last time I was in the (swank) Fauchon store in NY, I bought 2 floral infusions: Orange Blossom & Linden Blossom. The OB, I swear, smelled like nothing and tasted like mushrooms. The LB smelled AND tasted like nothing. I suspect these were not as fresh as you might expect from such an expensive store. Will have to try again! Oh no, what a shame! I actually don't like orange blossom infusion: I find it slightly sickly, but fresh tilleul is really lovely. These days I use sachets, but I used to buy it loose in an old-fashioned “herboristerie” in Paris. In the book 'Last of the Dandies', which I have read about 4 times, there is actually no mention of Alfred d'Orsay having created any perfumes. It says that the company Parfums d'Orsay was actually started in Berne in 1911. There isn't any actual connection with Alfred apart from the name which was used purely on a commercial basis. Hi Prince Barry, I didn't mean to imply that the infromation was from the book, which I haven't read (is it good?). It is from various sources on the web. As I understand it the only connection between Count d'Orsay and Parfums D'Orsay is the formula for the one fragrance. Sisonne, it is still listed on their website so I will take a look at Sephora and see if they have it in stock. Hi Prince Barry, I wonder if you could recommend any other books on Dandyism for me? I've long been a fan of Dandyism, and I'll start with the Count D'Orsay book, thanks to this column, and you sound like a great resource! I wasn't meaning my reply to come across the way it did. I just re-read it and thought..oops! Parfums d'Orsay are quite clever at using poetic licence. To my knowledge, Alfred never even created any scent. It was just their way of selling scent in a romanticed way. Qwendy, I would also recommend 'Who is a Dandy?' written by George Waldon. The book also includes a translation of Jules Barbey D'Aurevilly's book essay called 'On Dandyism and George Brummell'. Thank you Prince Barry, and Beau Brumell, of course, duh! I wonderful if there are wonderful engravings of Dandies to find in Paris? There was just a show of Meveilleuses and Incroyables there and I'm going to see a catalog over the weekend. Thanks again! Qwendy, the National Portrait Gallery in London has some wonderful pictures of Alfred d'Orsay. Copies can be ordered over the internet on their website. Just type in 'alfred count d'orsay'. I actually got the print of the picture on the cover of Last of the Dandies from the NPG. No worries on my end! I did read that he created this “Eau de Bouquet” for his lover, and javaslublu lists him as the “nose” for that fragrance, but it would not be the first time I read something misleading or incorrect online. Yes Robin, I have also read about Alfred creating Etiquette Bleu for Lady Blessington on the web and also in literature from Parfums d'Orsay themselves. The funny thing is that Alfred was also having an affair with Lord Blessington too!!! I suppose this claim is similar to the many claims that Creed make. They claim that many of their scents were created for many (deceased) personalties. There is nobody around to prove them wrong because all the people who they are using to sell their scents, are all dead. The same thing applies to d'Orsay. He didn't have any children and no heirs so..who knows??? Ah, now see, from the very little I had read I thought he created it for Lord Blessington…didn't realize he married the daughter and was having affairs with BOTH of the parents? I am going to have to read the biography. Agree, there is no way to verify all these claims to celebrity connections and it is best to take it all with a grain of salt. I did hear that news, shocking! If it is really over trademark issues with the name “extrait de Songes”, it is completely shocking. Don't they check first? Your best bet with anything discontinued is to add an automatic search in ebay….things have a way of popping up there long after they have been taken off the shelves. Good luck! Hi, Actually I did try eBay, and found startlingly few results, but I'll keep checking there… Any other ideas? I had hoped someone from this blog would reply and say they'd bought some and still had it! Are there any places that deal in discontinued fragrances? Thanks! You might also want to check the swap boards at MakeupAlley & Basenotes, although that is a long shot. Can't really think of anyplace else that would have a discontinued L'Occitane, sorry!